Yet again, energy experts have gotten the oil market wrong: Less than two months ago, Brent crude was about $86 a barrel, and the talk was a certain return to ultra-profitable $100 oil. Today, Brent closed at $58.68, down 31% from the peak, after the industry's worst two months in a decade. Oil's biggest kingpins are now at the G20 summit in Buenos Aires, where they will try to set things right. But if they can't — for reasons including pressure from President Trump and their own divisiveness — look for a renewed bloodbath in oil, with danger for the world's petro-states and numerous other industries. What's going on: In oil and gas, the last decade has been an almost farcical series of bad calls — starting in 2008 with an oil price spike to $147 a barrel and a consensus that the era of low prices was over because of a fossil fuel shortage. Instead, shale oil and gas came along and, by 2014, the U.S. was suddenly awash in both. That was depicted as incredibly good news for the U.S., a platform for the U.S. to enter an industrial renaissance. Instead (another bad call) prices went into a tail spin, finally crashing below $27 a barrel. The carnage included dozens of oil company bankruptcies, a mini-recession for several industries, and hundreds of thousands of job cuts. "Analysts always tend to extrapolate current trends and miss turning points." In the latest chapter of this bad run of forecasting, analysts and traders watched as oil prices marched back over $80 a barrel in the last week of September, and most determined that that was the new normal. Except, as traders crowed at a big industry conference in Singapore that month, $100-a-barrel oil would be back soon, breaching a threshold that, during the rough patch, no one thought would ever be crossed again. 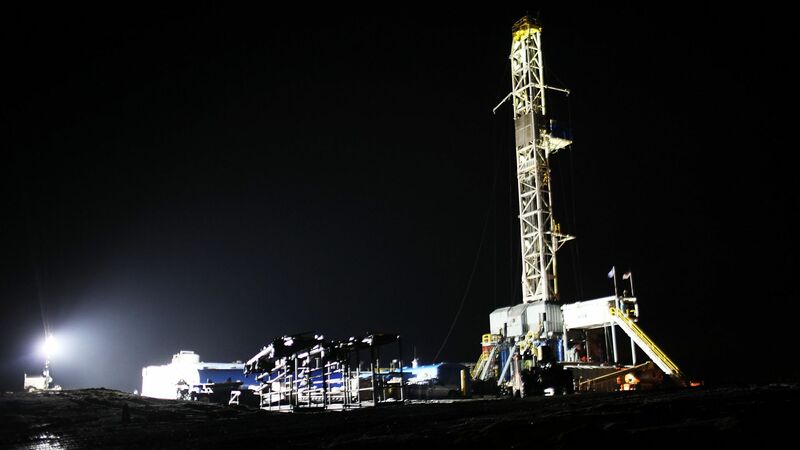 In a report today, the U.S. Energy Information Agency said that, for the fourth straight month, U.S. oil drillers have produced record volumes, reaching almost 11.4 million barrels a day, almost 2 million higher than a year earlier. The August and September year-on-year additions are the largest in almost a century. Astonishing fact: For the first time since 1948, U.S. net oil imports will drop to zero next year before stabilizing at about 320,000 barrels a day, analysts say. As usual, analysts cite a dozen reasons why they could not possibly have averted being blindsided, even though that's what the oil game is all about — avoiding being blindsided. That Trump would grant a slew of sanctions waivers to buyers of Iranian oil, rather than forcing much of it off the market immediately, said Amy Jaffe of the Council on Foreign Relations. Nor that Saudi — itself expecting Iran to be exporting relatively little — would pump a record 11.1 million barrels of oil a day. That shale drillers would continue their deluge — a whopping 5 million added barrels of oil including this year and next. That the global economy would slow: Barclays gives a 20% to 25% chance of a U.S. recession by the end of next year, and 25% to 40% in 2020, says Michael Cohen, head of energy markets research. What's next: OPEC is to meet next week in Vienna to discuss a production cut. But the real game is in Buenos Aires, where the most powerful men in oil — Russia's Vladimir Putin, Saudi Arabian Crown Prince Mohammad bin Salman, and, because of the power of his tweets, Trump — at the G20 summit. Saudi for one needs $73-a-barrel oil to finance the national budget, according to the IMF. Putin, with a break-even of $40, will go along with a cut because he is seeking Saudi investment in Russia, said Scott Modell, head of Geopolitical Risk at Rapidan Energy. In a meeting today, an OPEC advisory committee suggested a 1.3-million-barrel-a-day cut. That is precisely the 2019 oil surplus projected by the International Energy Agency, but it may be more — in a recent note to clients, for instance, Helima Croft at RBC, forecast a 1.4 million-barrel-a-day surplus next year with no cuts. The worst off in a sustained low-price era, Modell said: Venezuela and Nigeria. When Generation X was as old as millennials are now, they had significantly more financial assets — more even than the Boomer generation before them, according to a new report by the Federal Reserve Bank. Axios' Stef Kight writes: If any generation could be called "entitled," it might have been Gen Xers — if it weren't for the typically large debt that ultimately crushed their chances of wealth. The economic environment in the years immediately before the financial crash made it easy for young adults at the time — members of Generation X, born from 1965 to 1980 — to buy homes, cars and other properties, and to invest in stocks. But when you subtract the average Gen Xer's debt — mostly the easy-to-obtain mortgages — they weren't much better off than young Boomers before them, Bill Emmons, assistant vice president at the Fed in St. Louis, tells Axios. By the numbers: More than half of Gen Xers owned homes when they were 21 to 36, around the age of millennials today. Just 33.9% of the same age group in 2016 owned homes, the Fed said. Young Gen Xers were also more likely to own stock at that age than millennials or boomers, at 28%, compared with 15% and 14%, respectively. Millennials lacked the same financial opportunity to buy homes as Gen Xers at their age, and "as house prices have grown, they haven't been able to cash into that in the same way," said Lowell Rickets, of the St. Louis Fed's Center for Household Financial Stability. But even with the student debt crisis, millennial median and average debt is less than that of the generation before them when they were the same age, according to the report. The bottom line: With the financial crash, the investments that Gen Xers made when they were young still haven't really paid off, according to Emmons, and ultimately left them worse off. Millennials may not bear the same risk as Gen Xers did, but they are still having trouble accumulating wealth partly because of student debt. Two weeks ago, we spotlighted one possible future for the dying American mall: In Columbus, developers are transforming a mall into a city-within-a-city, complete with apartments and nightclubs. Residents would possibly never have to leave Easton Town Center. Axios' Erica Pandey writes; While the thought of home-in-a-mall might scare some, Victor Gruen, an Austrian-born architect who pioneered the design of the modern enclosed mall, might have been pleased to see where shopping culture ended up going. Terry Lahti, a Future reader from Edina, Minnesota, wrote to Erica about her hometown mall, the Southdale Center. When it opened in 1964, Southdale appears to have been the first U.S. mall in an enclosed space, Before it, suburbia was covered with strip malls. Gruen said he made it enclosed to free Americans from “the terror of the automobile,” per WTTW Chicago. He envisioned an indoor space where people could spend time and socialize. So with the rise of mall-towns, “it’s back to the future,” Terry emails.